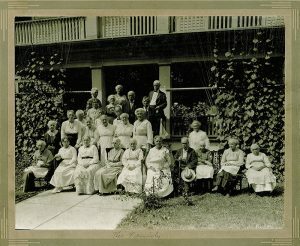 Founded in 1918, Wesbury’s story begins outside of Conneautville, Pennsylvania where Hyatt M. Cribbs, donated a portion of his farm to the ministers and laymen of the Erie Conference of the United Methodist Church. 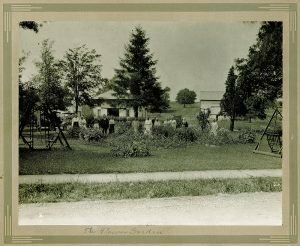 Starting out as a personal care home for elderly Christians who could no longer care for themselves, the Ida M. Cribbs Memorial Home was large enough to accommodate twelve residents and a few care-takers. The Home grew rapidly; by 1921 the institution consisted of more than 100 acres with at least three residences. In 1924, they were operating at a capacity of 70 residents and was considered to be the chief benevolent interest of the Erie Conference. In the late 1930s, a great many disastrous fires in “Homes for Older Persons” around the country caused the Board of Directors to contemplate replacing the original Cribbs Home with a new fire- resistant structure. In 1945, they officially decided that a larger, more modern facility was needed. Originally, the plan was to stay on the site in Conneautville as they had already provided services to 356 residents to that date. Ultimately, the Conference chose farmland north of the city of Meadville when sixteen acres of land known as “Green Acres” on Park Avenue Extension in West Mead Township was given as a gift from the people of Meadville. Groundbreaking occurred in the fall of 1950. In 1952, under the supervision of administrator Rev. George Braun, the first residents moved from Conneautville to the new Methodist Home for the Aged in Meadville. In an effort to reach out to make friends and raise funds for the needs of residents, the Sunset Auxiliary was formed in 1954 by Mrs. Florence Braun. This network of individuals within the area United Methodist churches is still going strong today and has supplied many amenities to residents throughout the decades. At the start of the 1960s, the 88-bed Methodist Home was operating at full capacity, and officials saw the need to expand the Home’s mission to include a geriatric hospital to support the increasing diversity in the health needs of the aging senior population. Rev. Braun, with the assistance of many volunteers and the Conference, raised the funds needed to construct a new 140-bed nursing facility on seven acres of land adjoining Methodist Home’s property. In 1971, the doors of the hospital opened, and the organization’s official name was changed to The United Methodist Home and Nursing Hospital. As the ’70s were winding down, Executive Director Rev. William Brown and the Board of Directors began looking into a new venture in senior living. The concept was to provide single-family residential facilities for those who wished to live an independent and maintenance-free lifestyle on the property, but still wanted access to the continuum of services and programs provided by the Methodist Home and Nursing Hospital. Constructed in 1977, the first villas located along Wesley Way behind the Nursing Hospital would be the start of the independent living program under the direction of Administrator of Residential Services, Ladd V. Lingo. Additional property purchased around the existing campus in the early 1980s made room for expansion. Phase Two would see villas built along Albright Drive, Thoburn Court North and Calvin Court. Today there are 64 villas. The 1980s saw continued growth and additions with the construction of a 70-bed intermediate unit at the nursing facility. At this time, the Board of Directors and Administration also made the decision to officially change the name of The Methodist Home and Nursing Hospital to Wesbury United Methodist Community. 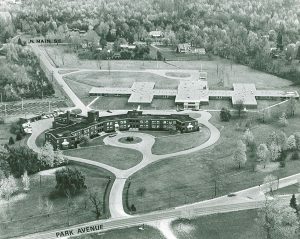 With the name change to Wesbury, the Methodist Home at Meadville became Cribbs Residential Center; the Nursing Hospital became Grace Nursing Center; and the independent living program was named Thoburn Village; all the names reflected the home’s history and Methodist roots. Much of what could be noted as Wesbury’s “modern era” began with an event scheduled during the summer of 1989. 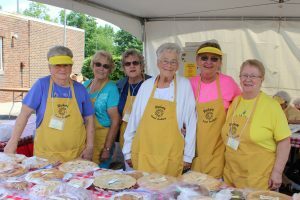 That June, the Sunset Auxiliary sponsored a Wesbury Family Picnic with fireworks that would grow to become a tradition annually marked on many area calendars, Wesbury’s Chicken BBQ and Craft Fair. Each year, the Chicken BBQ brings more people to the Wesbury campus than any other event. Over time, there have been additions to the event’s line-up of BBQ and crafters that include the Classic Iron Car Cruise-In, the Family Fun Zone, live entertainment and Granny’s Attic rummage, used book, and bake sales. Two years ago, the employee-driven “Chicken Run 5K” was added to the weekend to raise money for Wesbury resident’s Benevolent Care Fund. With a firm foundation established by his predecessors, much of this era can be attributed to Donald E. Clawson, Wesbury President from 1993 until his retirement in 2015. Having close to two decades experience in long-term care and a background in business, Don came to Wesbury from outside the previous leadership’s affiliations with the United Methodist Church. Don envisioned Wesbury as the area’s premiere resource center for the region’s aging population with modernized state of the art facilities for delivery of short and long-term care as well as increased on-campus senior living options. Under his leadership, renovations and expansions increased in all levels of living on the Wesbury campus as well as developing new programs and services that would be offered people in their homes through the region. Dedicated to advancing the Christian mission of Wesbury through promoting the needs of residents, and encouraging charitable contributions, The Wesbury Foundation was established in 1996. The Wesbury Foundation is a separate corporation created for the sole purpose of raising funds and building relationships for the residents of Wesbury. Each year, The Wesbury Foundation holds three major fundraisers in addition to their regular campaigns; The Wesbury Senior and Friends Golf Scramble held in June, The Wesbury Chicken BBQ and Craft Fair in July, and the Tribute Banquet and Auction that coincides with Wesbury’s founding in October. Wesbury is involved in many partnerships ensuring individuals and families that Wesbury works to provide the best resources to meet their needs. In 1997, Wesbury was a founding partner in Healthcare Ventures Alliance, a coalition of regional, not-for-profit, senior living communities. HVA pursues staff education and training, negotiates low-cost contracts for supplies, obtains grants to defray costs, and shares best practices for collective improvement to the quality of life of the region’s care recipients. Looking for ways to improve health care services available to area seniors led to the creation of Wesbury’s Home Enriched Living Program (H.E.L.P.) in 1997. The concept was to bring home and community-based services to homebound seniors throughout the region. Additionally, the first area Adult Day Care Center was started through H.E.L.P., where at-home caregivers could bring their loved one to a safe location while they did the errands and activities that need to be done away from home. These services continue today under the banner of Help at Home with Wesbury, offering a compliment of in-your-home programs and services that range from home-delivered meals and companion services to more recent additions like handyman home maintenance and beautician services. 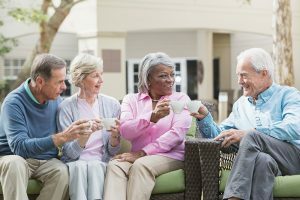 In 2016, Wesbury Care Cottages were added as an alternative to living in a Skilled Nursing Facility or Personal Care Home providing “one-on-one,” person-centered care in a residential setting. 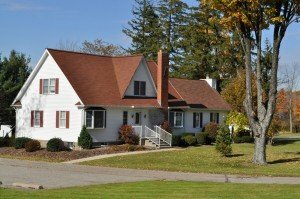 With locations in Meadville, Titusville, and Cochranton, each can accommodate three residents with twenty-four/seven, around-the-clock, companion services to assist the cottage residents with their daily needs. As Y2K approached, Wesbury turned its focus to proactively prepare for the injection of Baby Boomers reaching age 65+ who would bring significant impacts on healthcare and senior living. One of the first endeavors of the new millennium was the construction of the Larcom Memory Support Center connected to Grace Health Center. Opened in 2001, the Memory Support Center offers a unique environment with specialized programming designed for those with Alzheimer’s, Dementia or other memory impairments. Close to two decades after its construction, it is still considered “state of the art” in its concept and design. Secure outdoor courtyards, large corridors for walking, and glass atriums with expansive views ensure its residents experience a carefully supervised, fulfilling, and active lifestyle aimed to stimulate memory and independence. Focus shifted to Grace Health Center after the completion of the Memory Support Center, and the “Fulfilling the Mission” capitol campaign to renovate Grace began in 2003. During this ten-year transformation project, each resident room was redesigned. Additionally, Grace Health Center added the Emmaline D. Barco Chapel with its beautiful stained glass donated from a church that was torn down in Pittsburgh, the Neighborhood Grill, a new Beauty Shop, the Sunset Auxiliary Gift Shoppe, 4,200 square feet of new rehabilitative space, 3,700 square feet of dietary space, 2,000 square feet of new administrative office space as well as a new Medical Arts facility now being utilized by doctors from Lake Erie College of Osteopathic Medicine (LECOM). In 2015, Grace Health Center added rehabilitation to its official title, showcasing its continuing focus on short-stay rehabilitative services. 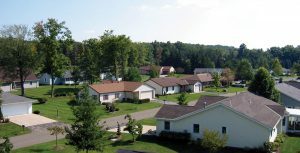 The Short-Term Rehabilitation neighborhood offers private accommodations designed for residents in need of intense therapy in order to return to their home. 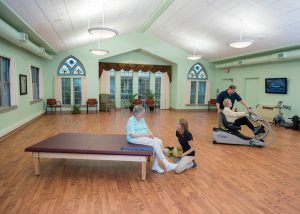 Annually, 60% of Grace Rehabilitation and Health Center residents are discharged upon healing. In 2006, Wesbury began a partnership with Northwest Pharmacy Solutions, LLC. What started as a closed-door pharmacy grew into a public pharmacy that today includes Northwest Community Pharmacy and North End Convenience Store located on the Wesbury campus as well as the recently opened Cochranton Community Pharmacy. To meet the initial need of providing services after discharge from a short stay, Wesbury became a founding partner in Visiting Nurses Alliance in 2008 with St. Paul’s Homes of Greenville and Concordia Lutheran Services of Cabot. VNA Alliance was later joined by Meadville Medical Center and Grove City Hospital to offer Crawford, Mercer and Venango counties a wider range of services provided by nurses and other health care professionals including Registered & Licensed Practical Nurses, Physical, Speech, & Occupational Therapists, and Home Health Aides. When Don Clawson came to Wesbury, it consisted of the one corporation, when he retired from Wesbury it was a part of five corporate entities. Moving into its second century under the direction of President Brian S. Nageotte, Wesbury will continue to assess the needs of the Meadville community and the greater Northwest Pennsylvania region. The senior healthcare landscape is continually evolving as innovative approaches to delivering healthcare in the most appropriate settings are developed. Wesbury is fully committed to remaining at the forefront of this changing scenery to offer the best healthcare possible in a place and manner that is most beneficial to the consumer. 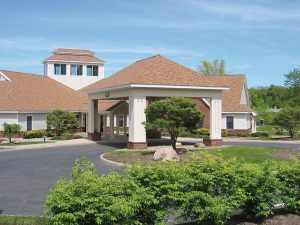 New developments like the acquisition of Family to Family Home Healthcare and the purchase of the Meadville Days Inn to create an affordable independent senior living option, position Wesbury to be able to provide the best quality services to customers from across the economic spectrum. For an organization like Wesbury, reaching a 100-year landmark is an awesome feat. While we celebrate our history, our mission-driven Christian roots, and the visionary leadership that guided us to where we are, you can be assured we will not rest upon our laurels, and our story is in no way over. As with everything that has happened in our past, we look forward to seeing how we can shape our future to serve the community for years to come.